With the rising incidences of data theft over the web, PC users are getting more conscious about security of their crucial and sensitive data. Owing to the serious results, they always keep trying to find an appropriate data security solution. Well, a variety of tools have been made available as a solution to such problem, but finding a suitable one could turn out to be troublesome. However, don't waste your important time in searching such a solution, and simply try out the new Gili Privacy Protector. GiliSoft Privacy Protector is industry-leading privacy protection software designed for individual users. It effectively prevents most illegal operations such as Hackers, Virus, Trojan and Spyware that damage or steal data from your computer.It can safely clean up all traces of your computer activity.It allows you to completely remove sensitive data from your hard drive by overwriting it several times. Gili Privacy Protector allows users to use six ways to protect personal privacy. 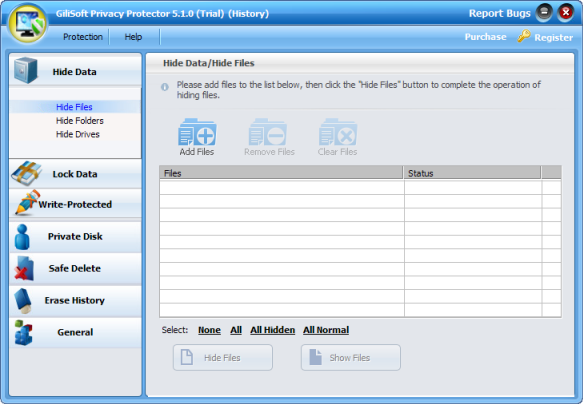 1 Hide Data : You can hide your private files folders and drives, to make them completely invisible to users and programs. 2 Lock Data : The locked files/folders/drives are protected from accessing, users can not open, read, modify, move, delete, copy, rename the protected files/folders without password. Files and sub-folders in a locked folder are also protected.3 Protect Data : The write-protected data are protected from deleting and writing.4 Private Disk : Private Disk gives you a secure space for all your work.5 Safe Delete : It allows you to completely remove sensitive data from your hard drive by overwriting it several times with carefully selected patterns.No one can recover deleted data from your disk if you secure delete it. 6 Erase History : It can safely clean up all traces of your computer activity.7 Password Protected: This is a password-locked software,that is to say,there's no other way to run or uninstall it if you have not the password. data protect,privacy protect,secure delete,safe delete,erase history,private disk,file encryption,protect file folder drive,history clean,folder lock,file lock A powerful and reliable privacy protection software designed for individual users.